Whether you’re contemplating moving to Yangon, planning a trip as a tourist or already living here, my top tips will help you make the most of your experience in Myanmar’s bustling commercial capital. 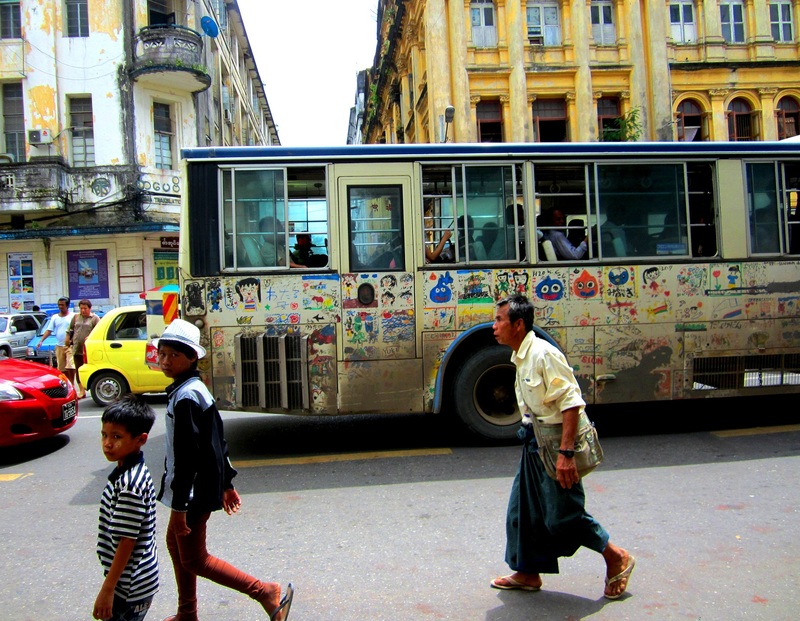 These days, Yangon is a city on the move. It also has some incredible street art, such as that pictured. A few months ago I was asked to do an interview with Jetstar’s inflight magazine. By mistake I answered every question instead of just a handful (oops), but as I receive quite a few emails from people who are about to move to or visit Yangon, I thought it might be handy to add a few more tips and post them here on my blog. Where can I find reliable info on Yangon? The absolute best source of “real-time” information is a Google group called Yangon Expat Connection. It has thousands of members – both expats and locals – and its forums contain a rich reserve of advice (tip: try searching before posting). I wrote an article about its history for The Myanmar Times, which you can read here. If you are looking to rent a flat, buy a car/motorbike/furniture, find a Myanmar language teacher etc it is incredibly helpful – and it also keeps you up to date with what’s going on in the city – whether it be a new gallery opening or a sporting team created. For event listings, try myanmore. The latest edition of Lonely Planet Myanmar came out in September 2014 – and it’s a worthwhile investment because the changes that have taken place since the previous edition was published in 2011 are vast. Click here to read my interview with coordinating author Simon Richmond, who spent a great deal of time updating the guide for our benefit. Another welcome new release is a book called “Expatriate in Myanmar: A Guide for Newcomers” by Janice Merchant. Frankly, the title undersells the content, which spans 200-odd pages and took 18 months to research. In addition to providing advice on planning your move, the shopping, entertainment and services directory is a boon for longish-term expats and has also been praised by locals (so I’ve heard!) for condensing need-to-know info in a very readable form. It’s stocked in Yangon’s popular bookstores such as Bagan Book House and Monument, or buy the e-book. Click here to read more about what it offers. Should I move to Yangon? This is a question I’m frequently asked because as Myanmar’s economy rapidly expands, an ever increasing number of foreigners are being offered the chance to relocate. The short answer is yes. Why? Because Yangon is unlike any other city (at least those I’ve known) and anyone with an open mind will be amply rewarded by the experiences you’ll acquire. 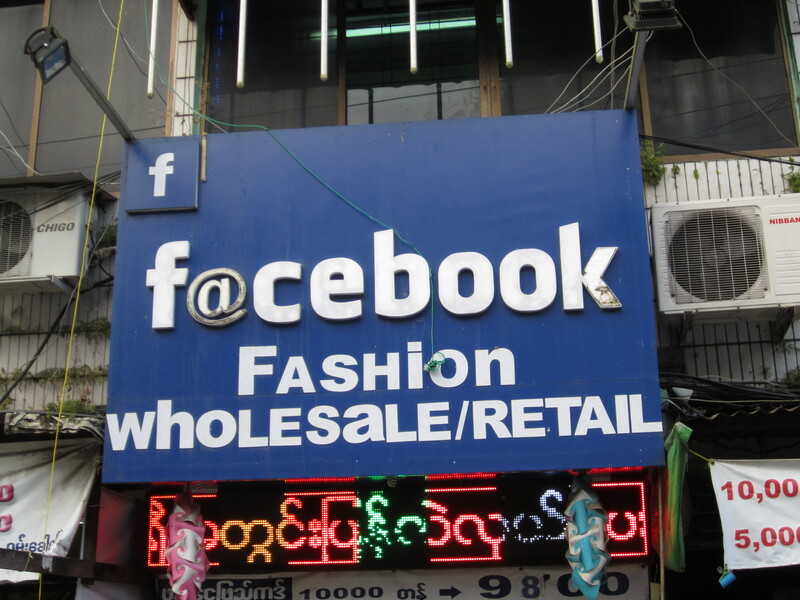 Until quite recently, Yangon was more of a town that a city, but so much has changed in a commercial sense (and will continue to at a rapid rate) that many of its infamous hardships (such as hundred dollar SIM cards, zero international banking and censored internet browsing) no longer exists. To me, the best thing about Yangon is that it has retained its unique charm and element of surprise. Over the past couple of years I’ve spent hours commuting in taxis (due to the dire state of public transport) yet I still find myself looking out the window rather than reading a book or checking my emails – just because Yangon’s street life is so interesting. And each township has its own distinctive quality – to the point where you may begin to wonder whether you’re still in the same city. Best bars: Yangon’s oldest ‘expat’ watering hole is 50th Street Bar and Café on (no surprise) 50th Street. A lot of new places have popped up in recent times – some close as quickly as they open, or move premises due to high rents. As most venues have a Facebook page, it’s worth checking that the address listed in a guidebook or whatnot is still correct. The cheesy-sounding Friendship Bar on Dhamazedi Road isn’t at all cheesy – and it’s also an easy venue for large groups. Union Bar is a swanky alternative – there’s two for one martinis on Friday nights and they pack a punch. Its “sister” bar and cafe, Gekko, is also beautifully designed and opened in March 2014. Water Library and Cask 81 caters for high flyers – The Water Library reportedly has the widest selection of spirits and liquors in the country (see photo above for proof!). Other great places include Sapphire Lounge, Mojo Bar (which has a terrific dance floor and is always packed on weekends), Flamingo Bar, Gossip Bar and Escape Bar. There are a lot of places sporting great views of the Shwedagon – examples include the bar on top of Alfa Hotel and that at Hotel Esperado. I did a bar crawl recently for My Magical Myanmar in search of Yangon’s hottest nightspots, which you can read here. 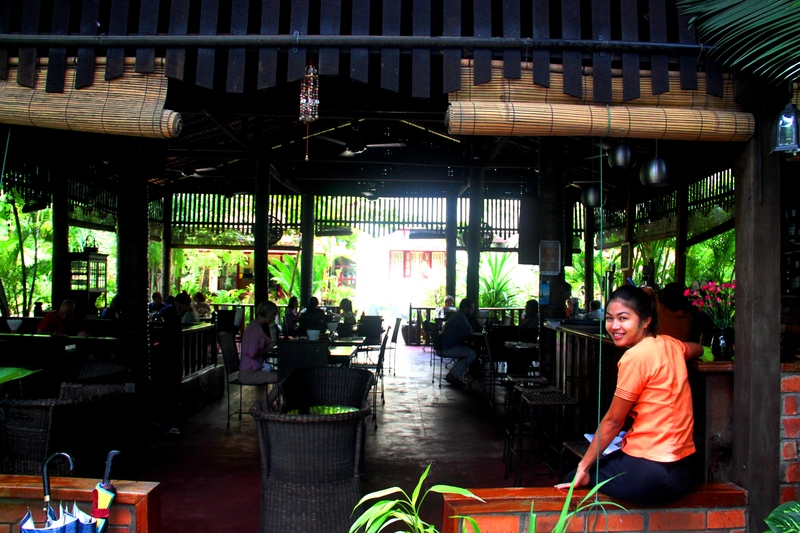 Though it’s more of a beer station [pub] than a bar, Kaung Myat is fantastic. It’s next door to the well known Ko San bar, which is a cheap, cheerful and increasingly popular hangout for locals and expats alike. There’s a Ko San at Hledan junction but I prefer the Chinatown venue, which is on the upper block of 19th Street (also known as ‘Beer Street’). At Ko San, you can sit out the front and soak up the atmosphere, or soak up your beers inside with aircon. Top three shopping spots: Bogyoke Aung San Market is geared towards tourists and has a fantastic range of jewellery, lacquer ware, paintings, clothes and antiques – it’s reasonably pricey though. Junction Square shopping mall has a huge range of fashion and it’s possible to buy Lacoste and other top range brands for almost half the price of Singapore or Australia. I like a clothing store downstairs called Rag and Denim, and it also has Etude House – lovely cosmetics and beauty care from South Korea. Citymart Marketplace on Dhamazedi Road is Yangon’s best supermarket – almost any craving can be satisfied here and it has specific portions of aisles for foods from Australia, Italy, Japan, Korea, and so forth. That said, stocks tend to change from week to week so buy in bulk! Top three places to catch a live band: Since MTV organised a concert at Peoples’ Square in January, a number of international bands are beginning to tour in Yangon. The outdoor venue has a backdrop of a 2000-year-old, 60 tonne gold pagoda, which is magical. 50th Street Bar and Cafe has regular gigs and it’s a beautiful building with a spiral staircase cutting through the middle. Allaince Francaise is probably the only other venue available for live music. Yangon also has a vibrant hip-hop and metal scene. Concerts by Myanmar artists are usually advertised on billboards. 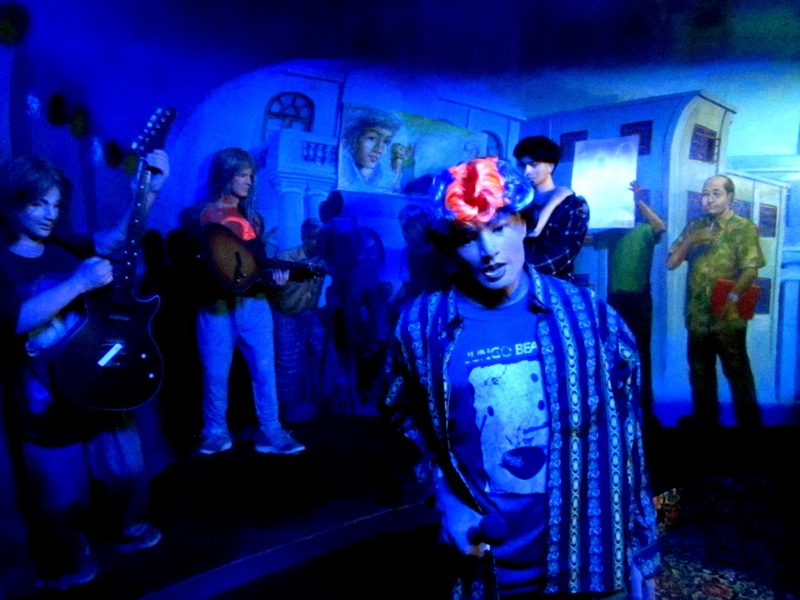 Open mic sessions are held at Nawaday Gallery. 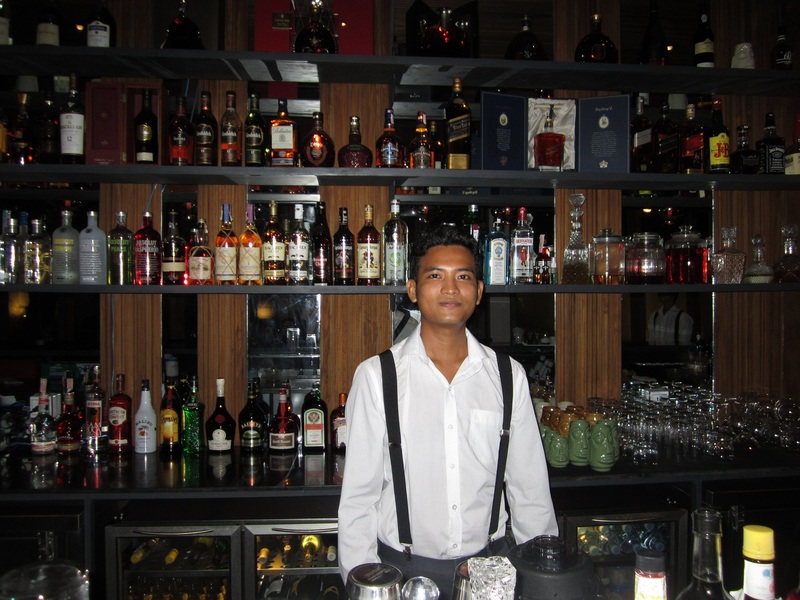 Myanmore and Yangonlife provide comprehensive nightlife guides on their websites. Best day trip from the city: Dala village – take a ferry from opposite the Strand Hotel and 15 minutes later you’ll find yourself in another world. 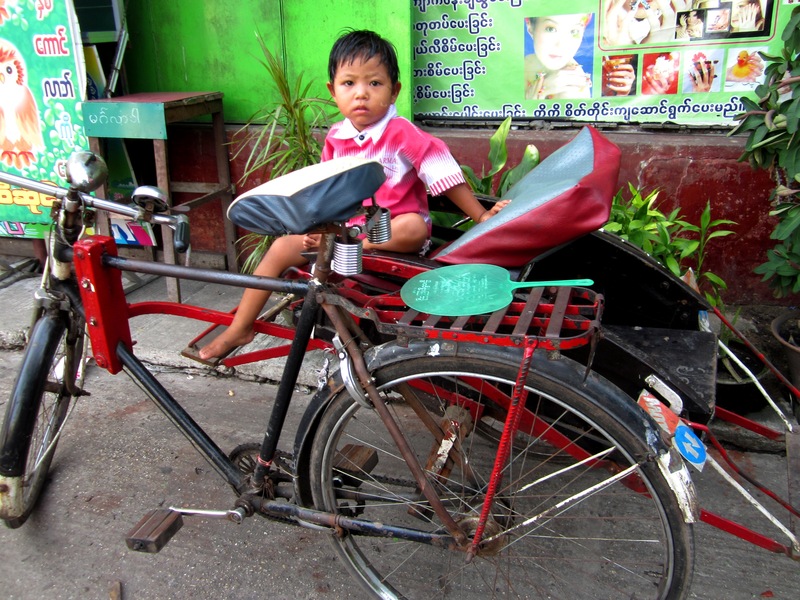 Hire a trishaw or motorbike to get around. Visit in the afternoon and you’ll see women carrying huge containers of water on their heads after pumping water from the wells. Ask your driver/trishaw to stop off at a palm toddy drinking station. Toddy is a local brew across Southeast Asia and India that has quite a kick. NGOs neglect this area for a variety of reasons, so please make a donation if you can. Hope School and Orphanage is one of many worthwhile causes here and it’s well known to trishaw/motorcycle drivers. Where can I get a great steak? Onyx Restaurant (opposite Savoy Hotel on the corner of Inya Road and Dhamazedi Road) is fantastic. The wines are wonderful and the prices impressively low. Best place for outdoor exercise: The pavements in Yangon aren’t at all reliable for jogging – you could end up a foot deep in sewerage! So I recommend Kokhine Swimming Pool – a complex with two 25-metre pools, plus a great restaurant and bar (to pack a few calories back on!). There’s a 50 metre swimming pool on U Wisara Road (the National Swim Centre) but you need to sign up for a monthly membership (which is about K25,000 and you need to bring your passport). Best local nature spot or park: Kandawgi Lake is 110 acres and it’s great during the night or day. There is a boardwalk around the lake, which has a stunning royal barge (also a restaurant) and there is also a public swimming pool. Quite popular with joggers and people having a picnic – there’s also a large selection of lake-front restaurants. Inya Lake is also beautiful. If you need a giraffe with a scarf, head straight to Pomelo! 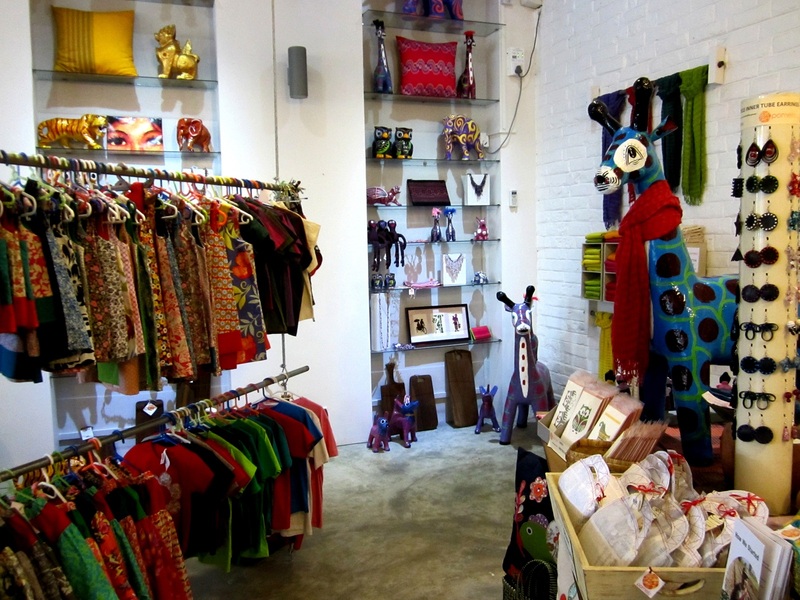 It’s my favourite handicrafts store in Yangon – and it’s all fair trade. Best coffee: Hard question… Sharky’s probably has Yangon’s finest coffee (and delectable home-made ice-cream, bread and all things deli-related), though there are now multitudes of places serving great coffee. As you’ll see in the comments below, a reader called Ian suggests that the swanky Boon Dutch Deli and Espresso Bar, which is next to Bogyoke Aung San Market, trumps anywhere else in Yangon. Yangon Bakehouse in Pearl Condo is another excellent choice – and it’s a feel-good one too, because the social business trains women from disadvantaged backgrounds. Coffee is also widely available at streetside eateries, though it’s sometimes made with two-in-one sachets. Try asking for “coffee kaka” which is stronger and less sweet. 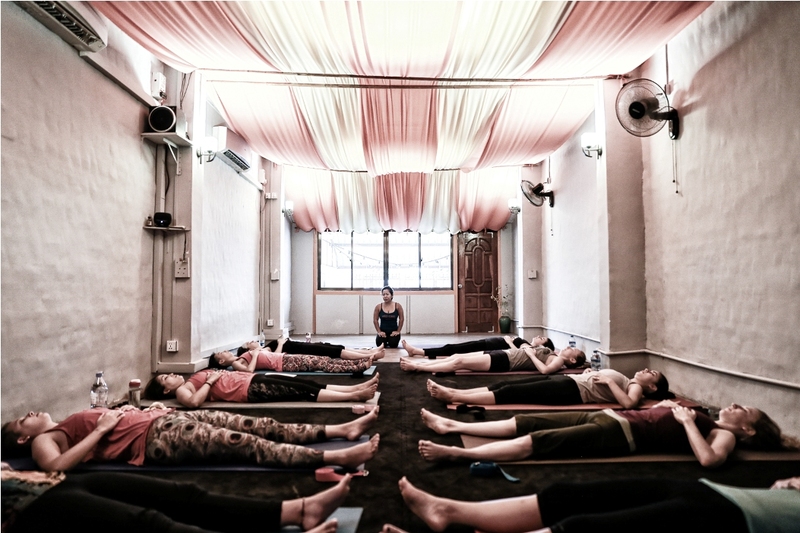 Best yoga: Yangon Yoga House has an excellent yoga studio and a wide variety of classes taught by yoga master Jojo and other instructors, as well as pilates and barre. The class schedule is posted on the website – you can book online or try your luck and just drop by (which I don’t recommend for the Sunday class I attend as it’s really popular). You can pay upfront or get a discount with a 10 class pass. Is Yangon a safe city? Yes – it may be one of Asia’s safest cities. Incidents of crime are very low, particularly against foreigners. I’ve had friends visit from Cambodia and Vietnam and they were shocked to learn that you don’t have to keep a close eye on your bag while drinking at a beer station or whatever. Traffic is possibly the biggest danger – but it’s far less nerve-wracking or congested than in places such as Jakarta, Delhi, Dhaka or Mumbai. Best date restaurant (or spot for intimate dining with a partner): L’Opera serves wonderful Italian food and the wine glasses are generously filled. The candlelit interior overlooking the garden dining area is particularly romantic and the service is really good. 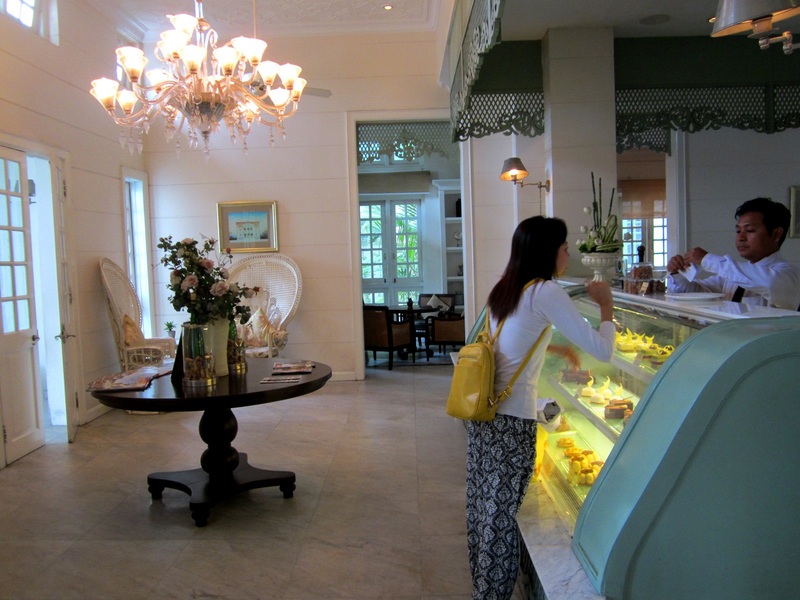 The French restaurant L’alchemiste, which faces Inya Lake, is also very beautiful. Where can I buy furniture for my home? MK Furniture at Excel Treasure Tower has nice some really nicely designed pieces from Thailand – it’s located under the Shwegondine flyover (however it will relocate in October 2015 – to where, I am not sure I’m sorry). Modern House Furniture on Yaw Min Kyee Street has fantastic couches that can be custom made (delivery is 10 days after ordering) and are great value. If you have deep pockets, head straight to Marchetti close by, on Kabar Aye Pagoda Road. Cooking appliances, plastic ware and furniture at lower prices can be found at Gandamar Wholesale, which is on the corner of Waizayandar Road and Gandamar Road in Mayangone Township. On the ground floor is a supermarket – there’s not a massive range of imported foods but it’s perhaps a little cheaper than Citymart and the alcohol range is excellent (ie a case of 24 Dagon beer cans costs around $12). You can also try posting on YEC or checking the forum regularly, although things are sold pretty quickly due to the high number of members it has (around 2,000). Ocean super stores are also good and popping up in different parts around town. Most beautiful view in Yangon: It has to be the gold and glittering Shwedagon Pagoda – it’s Yangon’s most iconic structure hands-down, and fortunately it’s so enormous that it can be seen from most parts of the city. The restaurant on the 17th floor of Sakura Hotel has a 360 degree view – it’s a good place to get yourself orientated, though the food isn’t much chop (there’s a rule: no food = no camera). Vista Bar (next to Yves Rocher at Shwegondaing intersection) has a fabulous view and it’s a beautiful bar. Same goes for Sapphire Bar. Best cheap eat: Lucky 7 is a chain of street eats that are reliably delicious and pretty hygienic. Lucky 7 serves everything from Shan noodles and avocado juice to Myanmar’s national dish, the noodle fish broth known as mohinga. It’s a little tricky finding Lucky 7 though, because the red, white and blue logo is in Myanmar. Best place to change currency: Yangon International Airport is a convenient option on arrival, now that black market rates are the same as the official exchange rate (the latter of which used to be a fraction of the black market rate). However there are so many places to change money these days, as well as ATMs for VISA and Mastercard holders, that you won’t find it a hassle. Downtown options to exchange money include Bogyoke Market and Summit Parkview Hotel. Make sure you bring pristine US currency though – anything older than 2006 will be knocked back, or if a note has the tiniest of marks on it. Pansodan Scene is a beautiful gallery and it also hosts public lectures on Sundays, as well as Burmese classes, as pictured. 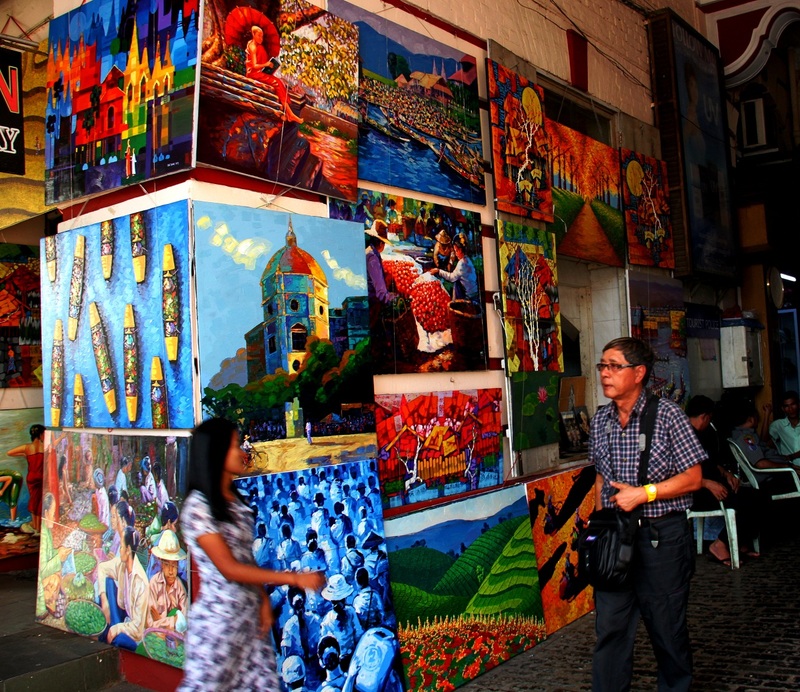 Its located on the upper floor of 144 Pansodan Street. Where to go if you want to party: GTR Club on Kaba Aye Pagoda Road (turn right as soon you approach Inya Lake Hotel) gets going from 10pm and is packed by midnight. There are two poles on small stages – usually occupied by a group of friends rather than hired dancers or anything saucy like that. DJ club is opposite, but gets a smaller crowd. Dress to impress at both. MBox is also fun – it’s opposite People’s Park (has karaoke too) on Ahlone Road at the Yangon International Hotel compound. And there’s a newish club downstairs called Rehab that’s even better… It hosts a monthly LGBT night – FAB – which is a lot of fun. 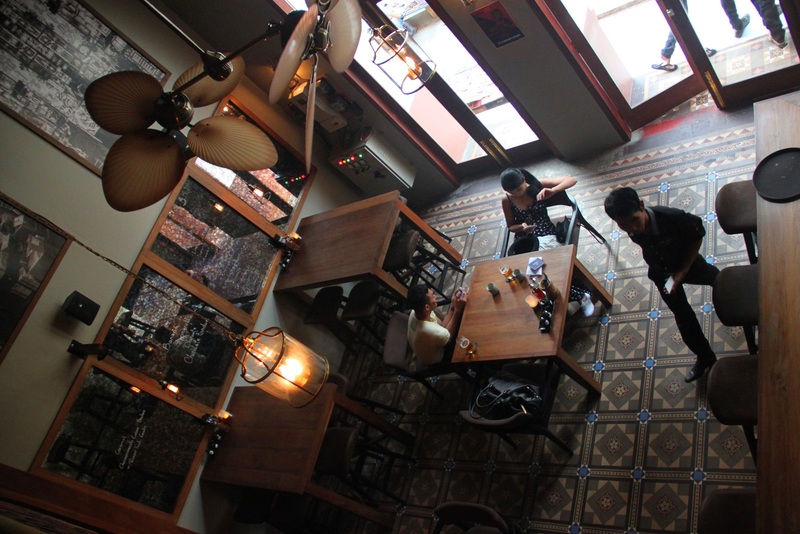 The Lab at Shwegondine has a great atmosphere for drinks, as does the ‘speakeasy’ called Blind Tiger in Yaw Min Kyee. Sadly, the local authorities introduced an 11pm curfew in Yangon in mid-2015, so things have been decidedly quieter ever since. The nightclubs I mentioned still go all night (I hear!). Where to go if you prefer a quiet night out: The Curry Table at the Governor’s Residence is a buffet style meal in the grand, open-air teak building, overlooking the pool. It’s less than US$50 a person and includes unlimited beer and green tea. Gorgeous art, divine food and deeply atmospheric. I also love Coriander Leaf, an Indian restaurant very close to MBox (see above) and Alamanda Inn in Bahan Township. Best cinema: Nay Pyi Taw Cinema shows US releases and has a 3D cinema. It also hosts international film festivals fairly regularly. There are also cinemas at major shopping centres, such Junction Square. Mingalar cinemas owns most cinemas and you can check timings on its Facebook page https://www.facebook.com/mingalarcinemas?ref=ts&fref=ts If you’d like to see a Myanmar movie, go to Thamada cinema downtown, on Alan Pya Pagoda St. It’s best to buy a ticket at least an hour in advance or you’ll find yourself in the lower circle. There’s no English subtitles but it’s great fun all the same. Best theatre: The only theatre I know of is the National Theatre, which is on Myoma Kyaung Street in Dagon Township. 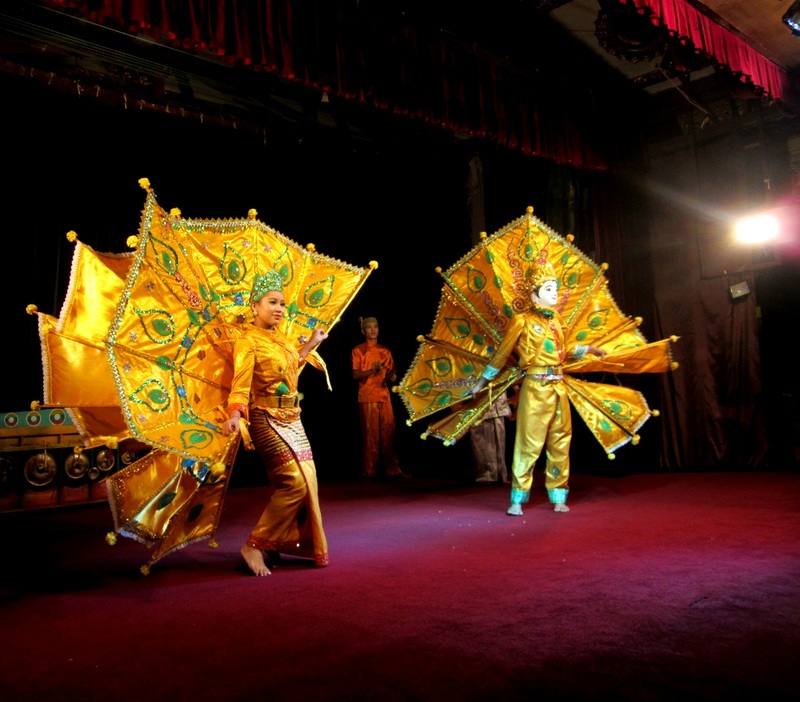 There are also cultural shows with traditional Burmese dancing held each night at 6.30pm at Karaweik Hall (the royal barge on Kandawgyi Lake). A friend said the shows were excellent. Dinner is served in the hall also. Where to get pampered? There’s an abundance of hair, nail and beauty salons throughout Yangon and services are extraordinarily good value. Tony Tun Tun has a great reputation for hair and Fancy House (which has a few outlets, including at Citymart Marketplace and a very large one in Parami) – is wonderful and also offers massages and waxing. Men are welcome also. However I enjoy going to the family-run beauty parlour around the corner from my place – a one hour massage costs just $5 and together with a hair wash and blow wave, plus toe and fingernails painted, it costs me just $12 all up! Best place to see live sport (and what sport): Myanmar people are crazy about football and although they’re less crazy about their own league than the English Premier one, watching a match during the Myanmar National League at Thuwana stadium is the best way to go. Most unique tourist experience: The Yangon Circle Line is a really old train that does a 50 kilometre loop around Yangon – at parts the scenery is very rural and it takes about three hours to do the full loop. The train leaves from Yangon Central Station and costs a dollar, but it’s possible to jump off at any station and see where you end up (there’s an interesting pagoda close to Insein station, for example, which is at the halfway point of the loop). 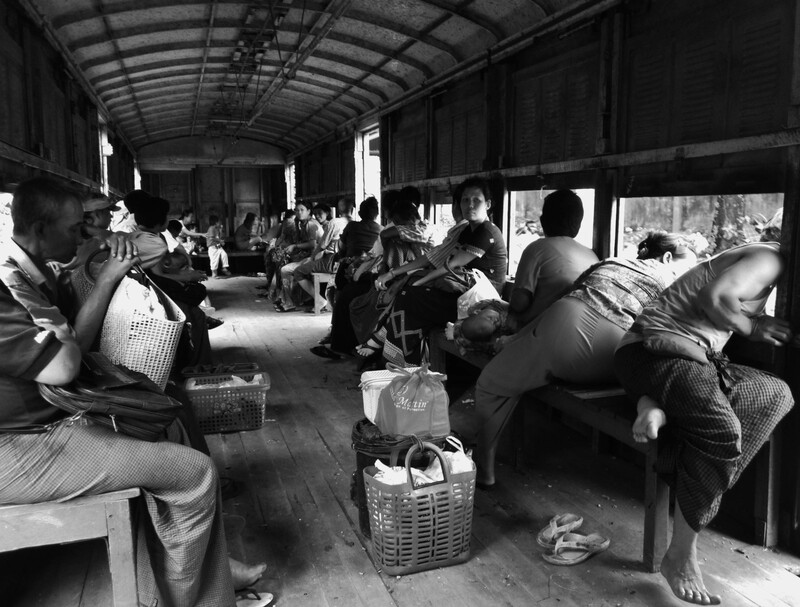 As well as watching vendors sell anything from bird feeders to cosmetics inside the carriages, it offers a glimpse of life in Yangon – particularly of those less fortunate and who eek out an existence by the side of the railway lines. Water buffalos can be seen swimming in muddy ponds during the wet season and there’s a massive ‘car cemetery’ where cars from the government’s car substitution program are stacked about 20 metres high, for about a mile. Best local dish: I love Myanmar’s salads – they’re like no other salad I know. Lahpethoke (pronounced lapeto) is a pickled tea leaf salad and it is considered a delicacy. Other ingredients included tiny dried shrimps, onion and sesame seeds. It’s served at most street cafes as well as restaurants. Try to scoop the meat or veg in your curry onto the plate of rice to avoid gaining weight from eating a tonne of oil (a mistake I made!). Best restaurant to try local produce: Monsoon Restaurant offers authentic Myanmar, dishes in a very comfortable and elegant setting, and a three course meal with a few glasses of Myanmar wine is likely to cost less about $20. Bill Clinton and Tony Blair dined there during a quick trip to Yangon in November 2013, if that’s anything to go by! Its menu also includes Cambodian, Laotian, Vietnamese and Western fare. 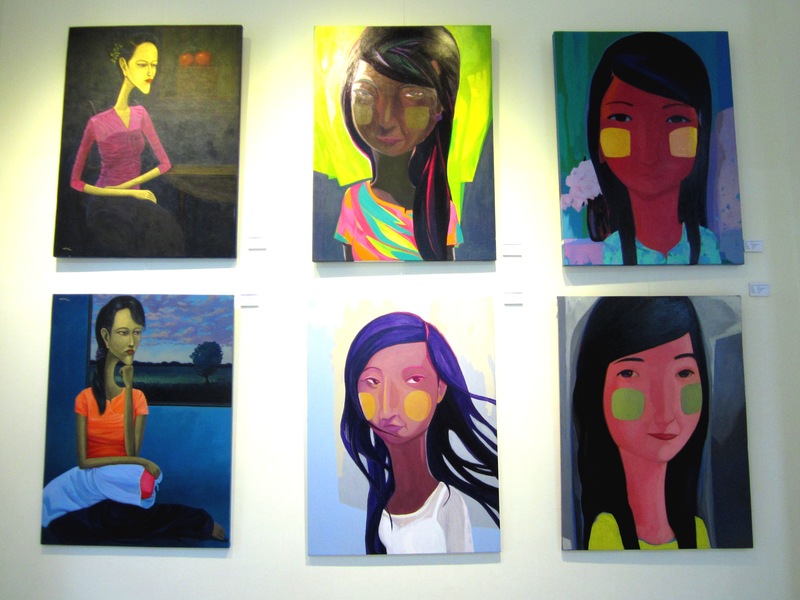 There’s also a chic yet cheap gallery upstairs that exhibits works by disadvantaged groups. It’s called Pomelo – I highly recommend getting souvenirs there. 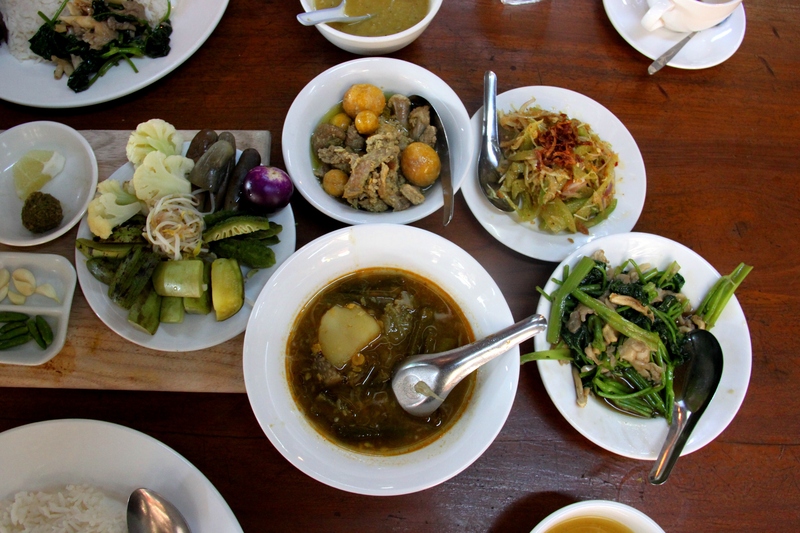 Green Elephant is another option, although it’s geared towards tourists and the curries lack enough spice and are quite oily despite recommending itself as a healthier Myanmar food option. Padonmar Restaurant has a very pretty garden for outdoor dining, as well having private rooms that are great for functions or special occasions. Click here to read my review of Padonmar. Best way to get around: An air-conditioned taxi (it’s the only way really, as the buses are hugely overcrowded and difficult to navigate if you don’t speak Myanmar). The chances of finding a taxi with AC are increasing, although metred taxis don’t exist. Expect to pay 1500 kyats for a short trip and about K5000 per hour and bargaining increments go up (or down) by K500. Best place to stay: If you book early and can afford the rooms that start at $400, the Governor’s Residence is a cut above the rest. It’s surrounded by lush gardens and the pool is spectacular. Word has it that it’s the number one choice for visiting celebrities as well. For the budget backpacker seeking a backpacker scene, try Motherland Inn II. I’ve heard really good things about the bed and breakfast at Bike World Yangon, which is located outside the downtown area. For longer visits (or even one night), try Yangon Home Stay – $40 a night and you have a home set-up with all the facilities that entails. Alamanda Inn (also a restaurant, mentioned above) gets rave reviews too. Best local festival: The water festival, better known as Thingyan, celebrates the Myanmar New Year and provides a welcome respite from the April heat. Water-throwing stages are set up in all the major cities and towns. It’s virtually impossible to stay dry as only the monks are spared from the high-pressure hoses and super soakers… I also love Thadingyut, “the lights festival,” which takes place at the end of October. Where do most expats live? In Golden Valley, Bahan township. I used to live further out in Parami (past Inya Lake) and I think it’s beautiful there too. I’m now in Tamwe and I like being close to the downtown area (about 20 minutes) but with less intense noise and traffic congestion. Shangri-La serviced apartments have a good rep and more and more families are moving in there. I know people who pay as little as $150 a month for a flatshare in the downtown area, though I think $400 is about the norm. The best way of finding a rental property is through Yangon Expat Connection. 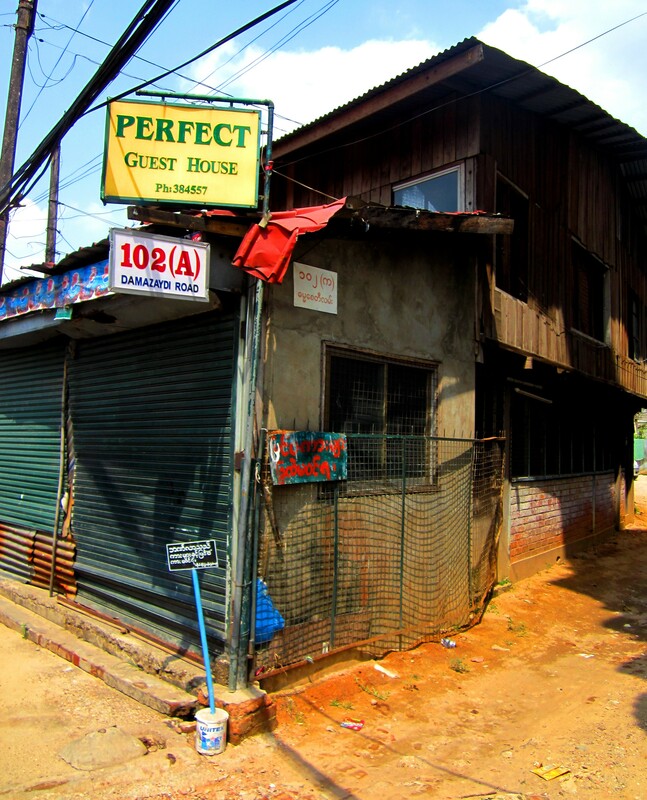 The worst thing about renting in Yangon is that rent must be paid up front – usually a minimum of six months or a year. Paying a year ahead is advisable, because landlords frequently hike up the price after the six month lease has come to an end. If it’s any consolation, I’ve heard that in Jakarta, landlords demand two years rent in advance… If you go through an agent here (advisable), you will also need to pay a month’s rate to them. Where to buy pets: There’s a pet shop on the ground floor of Yuzana Plaza, but conditions are fairly dire and depressing. I wrote an article about the pet import/export process, which you can read here. Better still, adopt a pup from Yangon Animal Shelter. They’re always on the look-out for people willing to foster a pup, even temporarily. I wrote an article about the shelter, which you can read here (my post also contains a list of vets in Yangon). For pet supplies such as cat litter and toys – even scratching posts – try Hello pet shop at Excel Treasure Tower, under Shwegondine overpass. You can also leave a donation for the Yangon Animal Shelter while there. 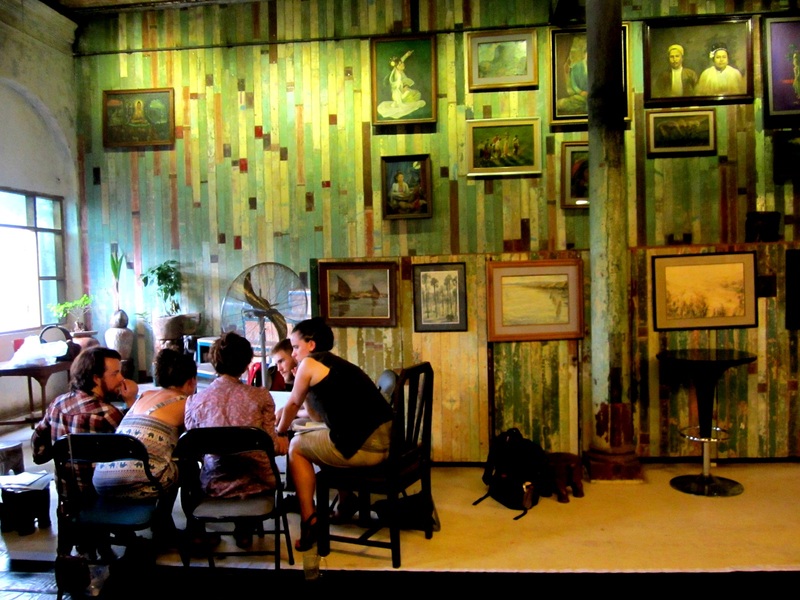 Yangon’s Drug Eradication Museum is one of the city’s quirkier attractions – and is possibly the creepiest! 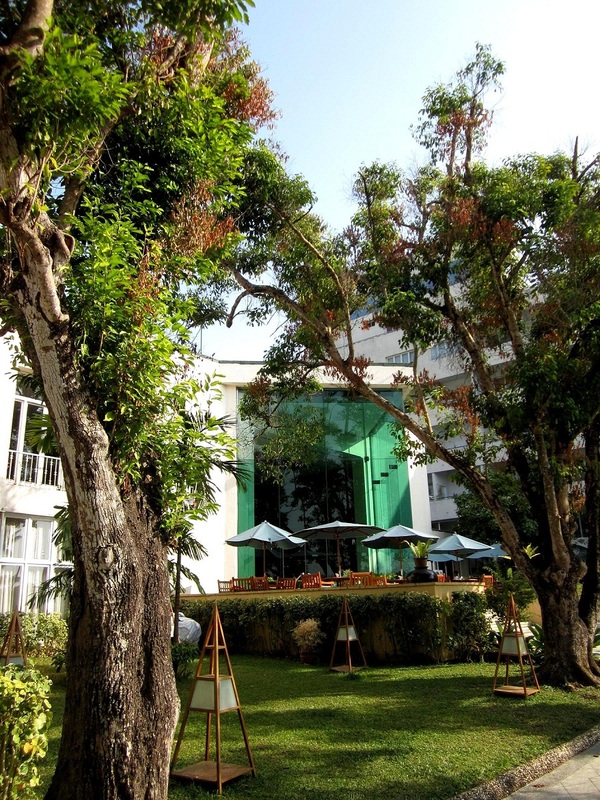 Best brunch: Inya Lake Hotel, without a doubt. The buffet range for every course is out of this world and the setting is really beautiful, particularly from the outside area, which overlooks a beautiful lake. It’s great value at $25 per person because it also includes unlimited sparkling wine and beer. From 11am to 2pm every Sunday. Other alternatives include Kandawgyi Palace and Sedona Hotel. September 2015 update – My new favourite place for brunch is Square Restaurant at Novotel Hotel. It’s an all you can drink and eat extravaganza for $30. The spread is eye-boggling. 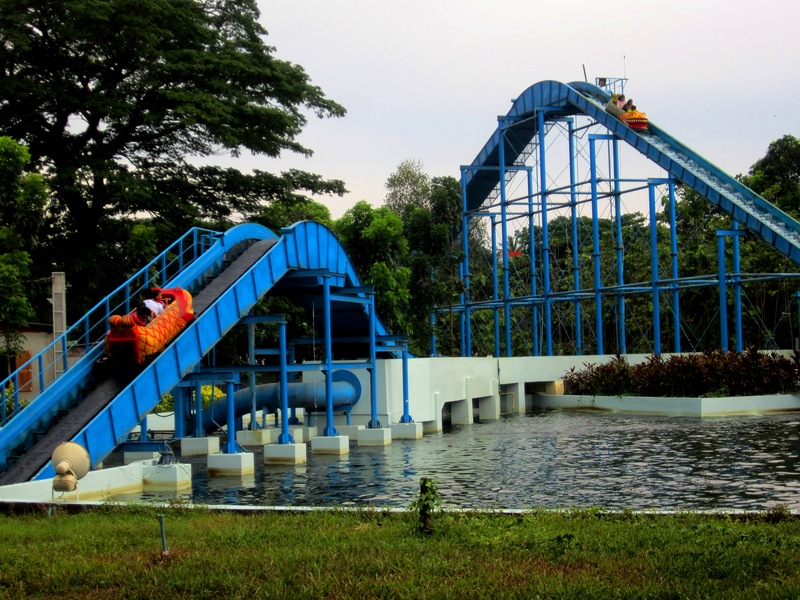 Where to take the kids: Either the Yangon Zoo or Happy World, an indoor amusement park. Keep an eye on your kids at the zoo because it’s pretty “interactive”! 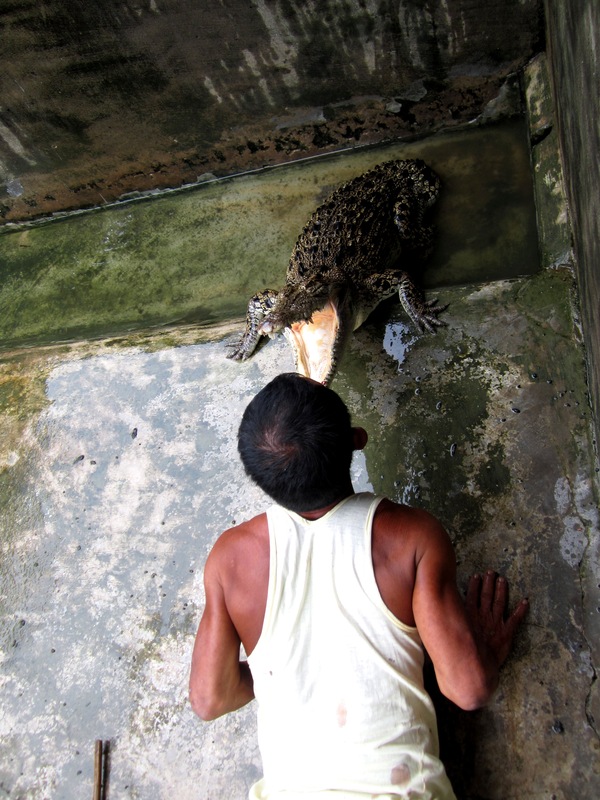 DON’T take your kids to the Crocodile Farm in Thaketa – it’s not even safe for adults!! Best place to relax: Lunch at the Strand Hotel. It’s the epitome of old world charm and a pleasant respite from the hustle and bustle downtown. Needless to say the food is faultless too. Must-have souvenir: A set of Burmese currency from the old days, featuring a portrait of Aung San Suu Kyi’s father, General Aung San. Available at Bogyoke Aung San Market. November 2013 update – Aung San will soon appear on Myanmar bank notes – so get the vintage ones while you can! Traditional parasols are very beautiful (and lightweight) – as is Burma’s famous lacquerware products. Where can I buy second-hand furniture? Beats me. Sure, there are regular “for sale” postings on YEC, but they tend to be sold in a flash for pretty high prices. Iit’s beyond me why there aren’t yet any second hand furniture stores in Yangon. Best local art gallery or artist: The River Gallery at the Strand has Andy Warhol-esque monk paintings, plus a great variety of antique styled souvenirs. In October 2013 it opened a second gallery, River II, just up the road from The Strand itself. Its range also includes modern art sculptures for the French artist Robert Patrick, who has lived in Myanmar for about 25 years. As Gill the owner once told me, Myanmar is possibly the last place in Southeast Asia where it’s possible to buy art made by the best for less than US$10,000 (!). 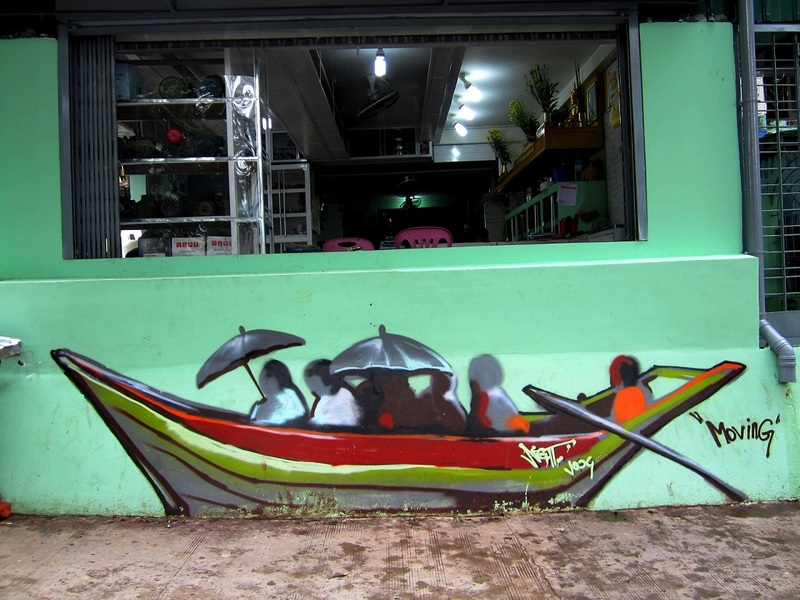 Nathalie Johnston’s blog, Myanmar Art Evolution, is a wonderful resource for getting the lowdown on all things Myanmar art. Best local designer or boutique/menswear shop: There’s a men’s tailor at Bogyoke Market called Mantops that’s a hit with my male colleagues. The fabric and stitching is a real bargain for the price apparently. I myself have never had tailoring done in Yangon due to language difficulties and a friend who has lived here for nine years says it’s not worth the hassle of returning for re-fittings time and time again. Look like a local and slap on the thanaka! Thing to do that will make you look like a local: Ladies can wear thanaka, which is a sandalwood paste that acts as a sunscreen and controls oil – most local women won’t leave home without it. Men can wear a lunghi, a one-piece wrap-around cloth. But there’s no buttons, zippers or ties so be sure to practice at home first! If you’re feeling adventurous, get yourself some betel to chew on. It’s a mild narcotic that you chew, not swallow. The “blood stains” you’ll see almost everywhere are courtesy of betel spitters. Where to send your kids to school: International School Yangon has a strong reputation and I was very impressed by its (resort-like) grounds. Horizon is also great. There is still a shortage of international schools, despite the addition of some new ones, such as the British International School. Where to buy a newspaper: It’s still not easy finding an English language newspaper on the streets of Yangon. Sometimes you’ll find what you’re looking for at Citymart or Family Mart supermarkets, or in cafes. The only daily English language papers are The Global New Light of Myanmar and The Myanmar Times. English language weekly newspapers/magazines include Myanmar Business Today, Mizzima and Irrawaddy. Most hotels and cafes have a good stock. Where to see a doctor: SOS Clinic at Inya Lake Hotel is meant to be good – but a consultation costs $88. When I fainted and fell on my head and needed stitches, I went to Yangon General Hospital. They did a good job – I had them removed at Bahosi Hospital on Lanmadaw Street and have but the faintest scar. If you need a pap smear, I believe Victoria Hospital in 9 Mile is the only place that can do that. The Australian embassy also has a medical clinic. Can I buy tampons, the pill and condoms in Yangon? Yes to all three. Tampons arrived on supermarket shelves in 2015 – they can be found (in small quantities) at CityMart Zawana Junction. Condoms and contraceptive pills are widely available at convenience stores and are mostly limited to the Marvelon brand.